If you're even thinking of being in Miami, check out the rest of our DestiNATION: Miami guide. It's stacked with expert advice from locals on what to eat, where to drink, and what to do. T here are so many Miamis. The one you think of first is probably wealthy. Or trying to look that way. High-end. Versace. Givenchy. Some other luxury brand you're supposed to know about, and possibly do know about. The kind of Miami that requires a big wristwatch, bottles to pop, fashion models dancing atop a table, and probably, somewhere in the club, the presence of Justin Bieber. Oh, and boats, too. Gotta get on a boat. I see this Miami every day. All the time. I live within a mile of LIV, the nightclub where our boy Justin hangs out. I'll head to Publix in my decade-old Mazda with its sun-bleached paint, crawling Collins Avenue at the same slow pace as the red Ferrari next to me. If I'm downtown, nursing a beer on the patio at Garcia's, I'll appraise powerboats gliding up the Miami River to dock at Seaspice, one of those restaurants where really good-looking people in very nice-looking clothes conspicuously consume $20 mojitos and, presumably, seafood. Spicy seafood? Don't really know. I've never been inside. Maybe you won the lottery. Maybe you inherited a steel company. This Miami is for you. I really like this Miami. I'm glad it exists. Some people dig expensive mojitos, and I want these people to be happy. And look, if you're coming down from New York or somewhere else -- Kansas City? Milan? Moscow? -- and you want to party away a weekend removed from your day-to-day stress, by all means come here. You can have a blast. The beach is great! The restaurants are great! The clubs are great! The boats are big. And who am I to say? Maybe you won the lottery. Maybe you inherited a steel company. This Miami is for you. Most of us here have been cast in some other version of the city. Ours is one of the poorest metropolitan areas in the country, which you probably know. It's an immigrant gateway, of course, everyone here from somewhere else. The mayors of both Miami and the larger, more important Miami-Dade County were born in Havana. Latin America dominates the culture, but there's also a strong European influence. Most condos these days are being bought up by Russians. Most of the people here aren't buying condos, though. They're just trying to get by. "That's the biggest problem with Miami," says Tad Schwartz, head of a prominent public relations agency. "We market luxury, but for the most part the population is poor." These other Miamis are just as interesting, if not more so. I've enjoyed sitting on a wooden bench in a Honduran dive in Little Havana, watching their national team play soccer on TV. I go out of my way to return to Liberty City, the neighborhood from the movie Moonlight. It's not a tourist attraction, as there are no places to really see, no attractions. It's very poor, and too often violent. Still, it's rooted; people in Liberty City have been in Miami longer than anyone. I like the Saturday street barbecues that pop up. Even better are the tangy chunks of conch served up in a Solo cup from the back of an ice cream truck. "There ain't no place like it," says Luther Campbell, the once-profane rapper who ran for county mayor four years ago. "Liberty City is the crown jewel of the whole entire South." This other Miami never stops serving up something I want to investigate, or taste, or just soak up on most Saturday afternoons. I'll be driving way down south, deep into the subdivisions of Kendall, closer to Key Largo than to Miami proper. I'll pull off for a hamburger and see, in some shabby concrete strip mall, a Wendy's, a PetSmart, a storefront advertising Asian massage, and also, tucked in a corner, this unknown nightclub of surprisingly high ambitions. Live Latin music acts all week long. Check out all these places, if you get the chance. When people visit, if they ask for my guidance, I try to take them to as many different Miamis as I can pack into one night. 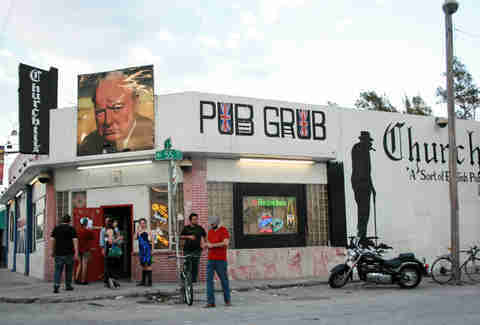 We'll start with shots at Churchill's, an English pub in Little Haiti. There might be a punk band playing on a stage in the back. A certain stomach-juice smell lingers from the bands that played the night before. 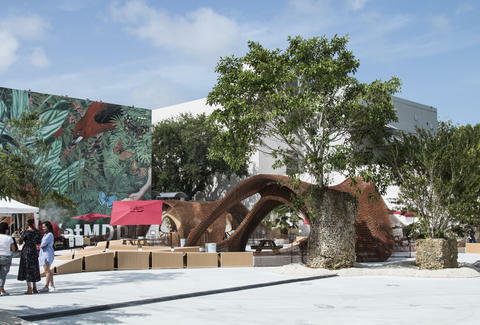 We'll shift to the Design District, now reinvented as a mall of the highest end. Gucci. Louboutin. We'll have oysters at Michael's, then maybe another appetizer at another of the restaurants that open and close with every season. Walking back from the bathroom at one of these places, a friend said, "There were women doing coke in there!" Wild, man, first time for everything. These rundown apartments, these auto body shops, these chickens running wild in the street -- this is Little Havana. Over to Wynwood. This landlocked neighborhood used to be nothing but warehouses. Now it's warehouses covered in graffiti. Its hipness is so calculated and fake, yet it somehow works. Wynwood is booming. New bars and restaurants open every day. (My mainstays remain Gramps and Wood Tavern, though I'm open to anything.) There's a gallery crawl once a month. No art has ever really grabbed my attention at these crawls, but the people-watching is first-rate. Wynwood is where a friend visiting from Brooklyn tells me she feels at home, that she's among her people. Take that however you like. 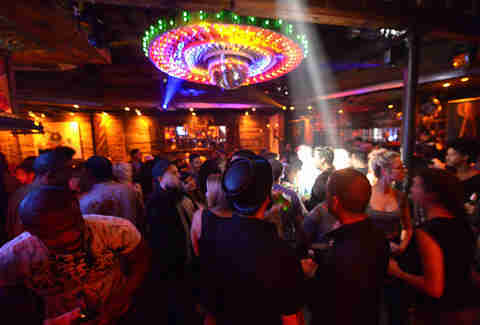 Over to Ball & Chain, a revamped club in Little Havana. I lived in that neighborhood for years. Tourists occasionally stopped me to ask for directions: Excuse me, do you know where is Little Havana? And I'd say, this is it. You're here. These rundown apartments, these auto body shops, these chickens running wild in the street -- this is Little Havana. Brickell is popping these days. Coconut Grove, Coral Gables, too. South Miami -- hell, even Hialeah. I can't do everything, man. If I don't cross back to the Broken Shaker on Mid-Beach, I'll return to Wynwood for live EDM upstairs at the Electric Pickle. South Beach isn't really the place to be these days. Too many shops on Washington Avenue sit vacant. There are a disquieting number of shootings on Ocean Drive. Yet I'll always want to finish up with a couple Presidentes at the Deuce, the best dive bar still standing. I'll inhale the secondhand cigarette smoke and listen to the jukebox under a pink glow of neon installed decades ago for the TV show Miami Vice. When I'm done, last stop is La Sandwicherie, right across the street. I like salami and provolone drenched in the signature mustard vinaigrette. Listen to the jukebox under a pink glow of neon installed decades ago for the TV show Miami Vice. The best things in life are free. To a point. My favorite days in Miami don't cost a thing. Fortunately. I like to go to the beach. Often. I like to picnic on the lawn at the Gehry-designed New World Center. When there's a symphony inside, it projects a simulcast onto an outside wall. A top-notch speaker system, along with the picnic dinner, makes the Wallcast™ a better experience than sitting inside. After the show, walk to the west end of Lincoln Road. The pedestrian promenade is evolving into just another shopping mall -- Gap, Apple Store, Banana Republic -- but it still has the palm trees and the pink sidewalks and a parade of tourists from around the world. The parking garage is a striking building, which I know sounds hard to believe. It's open-air, and towering, and so unique-looking that wedding receptions are sometimes held there. Take the elevator to the top public floor, the seventh. Get a view of Miami proper to the west, the Art Deco district to your left, and, to your right, the rest of Miami Beach, where most of us who live on the beach actually live. 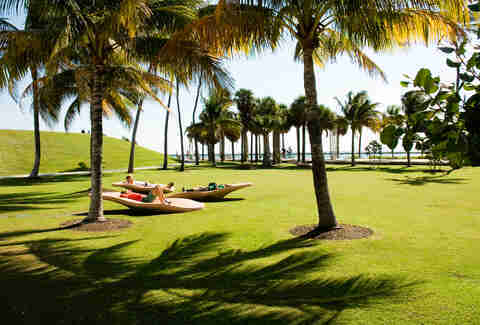 My best recommendation: Pass a late Saturday afternoon in South Pointe Park, at the bottom tip of Miami Beach. It's a public space so well-laid-out that I'm always surprised. Isn't Miami's purpose to be mined, extracted? Shouldn't all the best land be ceded to condos? Yet there's this gem. Wide grass savannahs. Winding hills. Get there around 4pm, in time to watch the cruise ships launch. They go out in teams, one after the other, slowly puttering their way to San Juan or St. Lucia. Sit on the rocks. Or walk all the way to the end of the pier. If it's summer, the fading sun takes the punishing heat with it, ushering the relief of night. In the winter it's all good all the time. Tourists walking. Locals jogging. Dogs running around near a play area where little kids splash in a fountain. I like to get a book and pass a few hours. Cruise ship passengers wave as they pass. I wave back. Afterward, if it's possible, if you've come into money in some way you best not talk about publicly, I'd steer you to Joe's Stone Crab. Easily my favorite restaurant, and also the most Miami restaurant there is. It's a tip to say that you can get the claws cheaper next door at the takeout, and that you can eat them right then and there. If you do this you can also skip a wait of up to two hours to get into the main restaurant. But I don't actually recommend this. If you're going to go to Joe's, go to Joe's. Have the whole experience. First, wait those hours at the bar. Drink martinis or an expensive mojito. When you finally get called, step inside a dining room that is up-to-date, but which evokes the earliest, 1913-vintage days of Miami Beach. Simple wood tables covered in white cloth. Tuxedoed waiters. Order the large or jumbo claws, hash browns, a chopped salad, and creamed spinach even if you don't like spinach because ordering this side is what you do. Some people dine at Joe's so often they can wander down the menu to order the fried chicken. This chicken is supposed to be fantastic, but I'll never know. 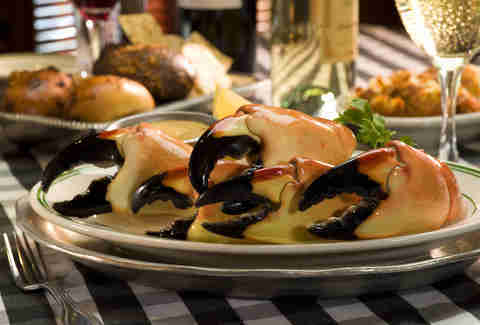 If I'm lucky enough to eat at Joe's, I'm getting the stone crabs. Served cold, it's just the claws, not the entire leg. The shells have been cracked already in the kitchen. You pull off the shell bits to get to the meat. Most everyone dips their claws in mustard sauce, but I stubbornly stick with warm butter, which is available on request. The taste, in a way, is neutral. It's clean, refreshing, and pure protein. Fantastic. As is the service. As are the side dishes, as is the Key lime pie that must be ordered for dessert. The whole restaurant is unpretentious, though it serves the very wealthiest people who flow through the city. Your George Clooneys and such. Professional tennis players. Miley Cyrus. Chinese tourists and tons of the vaguely rich "entrepreneurs" that populate Miami's social peak. The bill, when it comes, will land like an anvil. It's so expensive! But, hey. It's also wonderful, perhaps perfect. Sometimes you just have to spend that money. Sometimes you must mingle with the big-watch-wearing crowd and the fashion models. Some cool experiences are worth every cent. Robert Andrew Powell is the author of three books, most recently, Running Away: A Memoir.